As an independent dance maker, I aspire to make work that is relevant to the world we live in and helps us articulate new ways of living together and connecting with each other. I believe that the arts sector has the capacity to transform the conversation around climate change in our society and translate it into action. As artists, we have the responsibility to consider the impact that our work has on the environment around us. We need to think and act creatively in order to make our practice and operations more sustainable and inspire others to do the same. Joan Clevillé Dance is a small independent company with limited resources, but we are fully committed to making our work as sustainable as possible. This Green Policy is just a first step towards achieving our goals. We know that this is just the beginning and we still have a lot learn. But we are extremely passionate, and we invite everyone, venues, audiences, participants and collaborators to join us on this journey. In 2017, the company joined the Green Arts Initiative and over the past year have been producing our first Green Policy; a list of commitments we will aim to carry forward into our 2019 tours and beyond to reduce our carbon footprint. 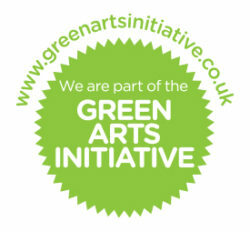 Joan Clevillé Dance’s Assistant Producer Vicky Wilson will act as the company Green Champion. If you have any feedback or suggestions that can help us reduce our carbon footprint please contact Vicky on vicky@joanclevilledance.com / 07502225825. Look at possibilities for ask audiences to contribute financially to the carbon footprint of the tour on a voluntary basis. Use the Ethical Consumer Guide to source the most environmentally friendly / sustainable suppliers and materials. Built for household goods but it could be applied to Electrical Appliances, Household AV Equipment, Clothing/Costume, Household consumables / Banking / Computer equipment, where cost allows. Add a ‘Green Policy’ page to our marketing, technical and promoter packs with suggestions of how we can work with venues to reduce our carbon footprint.